A close examination of the print reveals further subtle details. The “37”- “21” final score and “13”th national title are represented by the Texas players. Also the crystal football trophy features Alabama’s previous championship winning coaches (Wallace Wade, Frank Thomas, Bear Bryant, and Gene Stallings). Framing includes a gold coin. 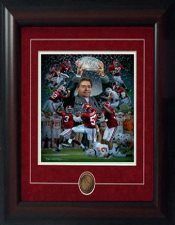 I will have to say I was a big hit at Christmas , I purchased 4 of these framed print's for family at a much higher retail price of ($100) ea.. It was so good to see everyone going crazy over their present's . We are a Crimson Family so everyone was overjoyed with their present's. I also gave them a magnifing glass - You can look in the crystal football and see the pic's of all the Championship Coaches , this is so kewl .